Home » Latest News » And just what is ‘Phoebus’ lodging’? performances of one of William Shakespeare’s most famous works, ‘Romeo and Juliet’. The presentation of this play is part of the semester two study of ‘Romeo and Juliet’ undertaken by all Year 10 students. This performance was presented by Nicole, Tim and Ross, members of the Complete Works Theatre Company. Their performance of Romeo and Juliet was outstanding. 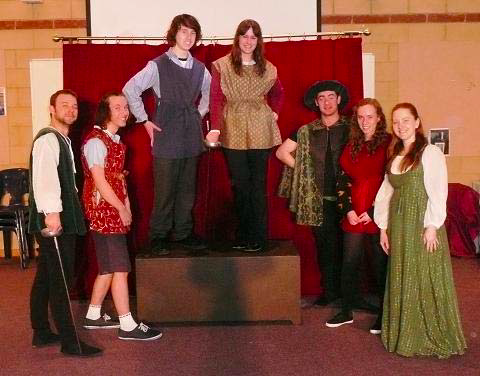 The actors, true to their claim that Shakespeare’s works were ‘meant to be played and not read’ really brought the play to life for their audience. Following the performance the actors generously shared their knowledge of the themes and character portraits that are part of Shakespeare’s everlasting legacy to literature. Verona or did she really love her man? Was Friar Lawrence an egotistical idiot? Was Tybalt a better swordsman than Mercutio? What drove Tybalt to slide his rapier between Mercutio’s ribs? Did Lady Capulet have a drinking problem? These are just some of the timeless questions that were both asked of and answered by the talented cast. As well as an analysis of character roles the thematic content of the play was also given colourful consideration. The themes of love, revenge, family disharmony, fate, destiny and recklessness were all key themes discussed during question time. A highlight of the play was the contribution of four of Galen’s more theatrical students in Molly Burnett, Nick Dellicastelli, Jared Hargreaves and Eliza Honeybun who all starred in the opening scene. ‘Do you bite your thumb at us Sir’! These students really produced great efforts at short notice. Thanks guys and girls! e Year 10 English Curriculum for 2011. And just what is ‘Phoebus’ Lodging’? The first student who can give an accurate answer to this question will receive a small prize courtesy of the English Domain. Answers to be directed to Mr.Willett.